Lee Child, the author of many explosive exciting crime thrillers (AKA Jim Grant) was born 29 October 1954. His novels follow the exploits of tough former American Military Policeman turned investigator Jack Reacher as he wonders the United States and gets himself embroiled in all sorts of trouble. He was born in Coventry, England and his younger brother, Andrew Grant, is also a thriller novelist. His parents moved him and his three brothers to Handsworth Wood in Birmingham when he was four years old, so that the boys could get a better education and he attended Cherry Orchard Primary School in Handsworth Wood until the age of 11. Whereupon He attended King Edward’s School, Birmingham. In 1974, at age 20, Grant studied law at University of Sheffield, though he had no intention of entering the legal profession and, during his student days, worked backstage in a theatre. After graduating, he worked in commercial television at Granada Television, in Manchester as a presentation director, where he was involved with shows including Brideshead Revisited, The Jewel in the Crown, Prime Suspect, and Cracker. Grant was involved in the transmission of more than 40,000 hours of programming for Granada, writing thousands of commercials and news stories. He worked at Granada from 1977–1995 and ended his career there with two years as a trade union shop steward. He decided to start writing novels, after being made redundant from his job due to corporate restructuring, stating that they are “the purest form of entertainment.” Then In 1997, his first novel, Killing Floor, was published, and won the Anthony Award for Best First Novel and in 1998 he moved to the United States Some books in the Reacher series are written in first person, while others are written in the third person. He has characterised the books as revenge stories – “Somebody does a very bad thing, and Reacher takes revenge” – driven by his anger at the downsizing at Granada. Although English, he deliberately chose to write American-style thrillers. In 2007, Grant collaborated with 14 other writers to create the 17-part serial thriller The Chopin Manuscript, narrated by Alfred Molina. This was broadcast weekly on Audible.com between 25 September 2007 and 13 November 2007. Then On 30 June 2008, it was announced that Grant would be taking up a Visiting Professorship at the University of Sheffield from November 2008. In 2009, Grant funded 52 Jack Reacher scholarships for students at the university and Grant was elected president of the Mystery Writers of America. In 2012, his novel One Shot was also adapted into Jack Reacher; an American thriller film starring Tom Cruise, in which He has a cameo appearance as a police desk sergeant in the film. I would also like to read A week in Paris by Rachel Hore, which has been described as A compelling story of war, secrets, family and enduring love that examines how The different actions of The main protagonists and their friends have devastating consequences that echo down the generations. It starts September, 1937. After a young musician named Kitty Travers enrols at the Conservatoire on the banks of the Seine to pursue her dream of becoming a concert pianist. A young American doctor, named Eugene Knox catches her eye on the day she arrives in Paris. At first She lodges at a convent near Notre Dame but Kitty and Eugene soon fall in love, get married and have a daughter. But then war breaks out and the city of light falls into shadow and the little family must somehow survive life under Nazi occupation. Nearly twenty-five years later, Fay Knox, a talented young violinist, who was born the day World War II started and whose Father was killed during anAir-Raid which destroyed their London house, and now lives in a quiet Norfolk Village with her mother Kitty, visits Paris on tour with her Orchestra. Then While on tour in 1971, guitarist Jeremy Spencer disappeared and joined a Religious group “The Children of God” so they hired Bob Welch as their new guitarist and released the albums Future Games & Bare Trees, which featured the songs “Sentimental Lady”, &“Spare Me a Little of Your Love” unfortunately While on tour Danny Kirwan became Alcoholic and was sacked and replaced by guitarist Bob Weston, alongside vocalist Dave Walker and Savoy Brown’s road manager, John Courage. In 1973 Mick, John, Christine, Welch, Weston, and Walker recorded Penguin, then after sacking Walker The remaining five recorded Mystery to Me six months later containing the song “Hypnotized” . However The success of the album led to relationship problems, The McVies’ marriage was under a lot of stress, aggravated working together, and alcohol abuse. Weston also had an affair with Fleetwood’s wife, Jenny Boyd Fleetwood, the sister of Pattie Boyd Harrison, predictably these events led to Weston being sacked by Fleetwood & who cancelled the tour. Then bizarrely the band’s manager, Clifford Davis, claimed that he owned the name Fleetwood Mac and assembled a “fake Mac” with Fans being told that Bob Welch and John McVie had quit the group, and that Mick Fleetwood and Christine McVie would join the band at a later date. Luckily Fleetwood Mac’s road manager, John Courage, hid the real Fleetwood Mac’s equipment, compromising the fake band. Eventually though, the ensuing Lawsuit over who owned the name Fleetwood Mac was settled and Fleetwood Mac decided to manage themselves releasing the album Heroes Are Hard to Find in September 1974 also adding keyboardist Doug Graves. Sadly Bob Welch left so and while Mick Fleetwood was searching for a possible replacement he heard a song titled “Frozen Love” by an American band, Buckingham Nicks and was introduced to the guitarist from the band, Lindsey Buckingham asking him to join. Buckingham agreed, on the condition that his musical partner and girlfriend, Stephanie “Stevie” Nicks, also joined. The new line-up released the highly successful album Fleetwood Mac which included the hit singles “Over My Head” and “Say You Love Me”, “Rhiannon” and “Landslide” . The success of this album combined with the pressure to release a successful follow up album led to even more stress and marital strife andJohn and Christine McVie’s marriage ended as well as Buckingham and Nicks’ long term romantic relationship and Fleetwood divorced wife, Jenny. These traumas combined with a high consumption of drugs and alcohol led to the release of the classic album Rumours, in which they laid bare the emotional turmoil experienced at that time. Critically acclaimed, it was the recipient of the Grammy Award for Album of the Year for 1977. Hit singles included Buckingham’s “Go Your Own Way”, Nicks’s U.S. No.1 “Dreams”, and Christine McVie’s “Don’t Stop” and “You Make Loving Fun”. Buckingham’s “Second Hand News”, Nicks’ “Gold Dust Woman” and “The Chain”. After the success of Rumours Buckingham and Fleetwood made the next album more experimental and the result was the ambitious and quirky 20-track double album, Tusk, containing the songs “Tusk”, “Think About Me” and “Sara”. Then during the subsequent world tour the band recorded music for the Fleetwood Mac Live album, which was released in 1980. The next album, 1982′s Mirage, followed 1981 solo albums by Nicks (Bella Donna) and Lindsay Buckingham (Law and Order). Songs on Mirage include “Hold Me”,“Love In Store”,”Gypsy”,”Oh Diane”, “Eyes Of The World” and “Can’t Go Back”. Following Mirage, the band members went on to pursue solo careers. Stevie Nicks released two more solo albums – The Wild Heart and Rock a Little. Lindsey Buckingham issued Go Insane and Christine McVie released an eponymous lay titled album featuring the songs “Got A Hold On Me” and “Love Will Show Us How”). Sadly though success took it’s toll and Mick Fleetwood filed for bankruptcy, Nicks was admitted to the Betty Ford Clinic for addiction problems, and John McVie had suffered an addiction-related seizure all due to their excessive lifestyles and It was rumoured that Fleetwood Mac had finally broken up. However Fleetwood Mac recorded Tango in the Night, in 1987 which became their best-selling release since Rumours and contained the songs “Little Lies”, “Everywhere”,”Seven Wonders”, “Big Love”. “Family Man”, “Isn’t It Midnight”. Lindsey Buckingham left and Following his departure, Fleetwood Mac added two new guitarists to the band,Billy Burnette and Rick Vito. Vito, was a Peter Green admirer, and had played with many artists including Bonnie Raitt and had also worked with John McVie on two Mayall albums. Capitalising on the success of Tango in the Night, the band continued with a Greatest Hits album in 1988, which featured singles from the 1975–88 era, and included two new compositions: “No Questions Asked” , and “As Long as You Follow” . Then Following the Greatest Hits collection, Fleetwood Mac recorded the album Behind the Mask, which included “Save Me” and The subsequent “Behind the Mask” tour saw the band play sold out shows, Then in 1991, both Stevie Nicks and Rick Vito left Fleetwood Mac and in 1992, Fleetwood himself arranged a 4-disc box set spanning highlights from the band’s 25 year history, titled 25 Years – The Chain. The box set, which included four new songs Paper Doll, Heart of Stone, Love Shines and Make me a Mask. Mick Fleetwood also released a deluxe hardcover companion book to coincide with the release of the box set, titled My 25 Years in Fleetwood Mac, which features many rare photographs and notes (written by Fleetwood himself) detailing the band’s 25 year history. Mick Fleetwood, John McVie, and Christine McVie recorded another album as Fleetwood Mac, with Billy Burnette The band, minus Christine McVie, and toured in 1994 performing classic Fleetwood Mac songs from the initial 1967–1974 era, then in 1995, Fleetwood Mac released Time and disbanded. Shortly after disbanding Fleetwood Mac, Mick Fleetwood began working with Lindsey Buckingham again. John McVie was soon added to the sessions, and later Christine McVie. Stevie Nicks also enlisted Lindsey Buckingham to produce a song for the Twister film soundtrack. This eventually led to a full Rumours line-up reunion when the band officially reformed in March 1997. The regrouped Mac performed a live concert which was released as the 1997 live album The Dance. They also released the 20th anniversary of their Rumours album and In 1998, Fleetwood Mac (Mick Fleetwood, John McVie, Christine McVie, Stevie Nicks, Lindsey Buckingham, Peter Green, Jeremy Spencer and Danny Kirwan) were inducted into the Rock and Roll Hall of Fame and also received the “Outstanding Contribution to Music” award at the BRIT Awards.In 1998, Christine McVie left the band permanently, Her departure left Buckingham and Nicks to sing all the lead vocals for the band’s 2003 album,Say You Will, containing the songs Peacekeeper” and “Say you Will”.”Fleetwood Mac toured in 2009. The tour was a ‘greatest hits’ show entitled Unleashed, and Stevie Nicks also wrote a song for the Hurricane Katrina relief album. The Very Best of Fleetwood Mac was re-released and an episode of Glee entitled “Rumours” featured six songs from Rumours and sparking renewed interest in the album. Stevie Nicks’ also released a new solo album In Your Dreams. Fleetwood Mac reunited for 2013 minus two of the original members: Bob Weston and Bob Welch, both of whom are sadly no longer with us. Denny Laine, English singer-songwriter and guitarist (Moody Blues, Ginger Baker’s Air Force, and Wings) Was born 29 october 1944. 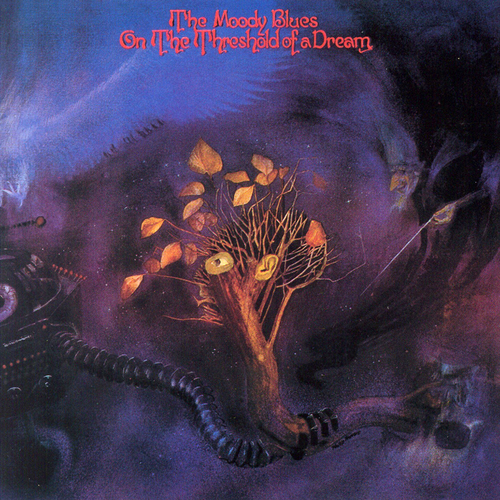 The Moody Blues formed on 4 May 1964, in Erdington, Birmingham, England containing Ray Thomas, John Lodge, Graeme Edge and Michael Pinder The name was a a subtle reference to the Duke Ellington song, “Mood Indigo. They released a single, “Steal Your Heart Away” in 1964 and appeared on the cult UK series “Ready Steady Go!” singing the uptempo “Lose Your Money (But Don’t Lose your Mind)”. But it was their second single, “Go Now” which launched their career & became a hit in the United Kingdom. Their debut album The Magnificent Moodies contained the hit singles “Go Now” and “Bye Bye Bird” together with one side of classic R&B covers. including a cover of “I Don’t Want To Go On Without You”,”From The Bottom of My Heart (I Love You)”, “Everyday”,”This is My House (But Nobody Calls)” and and “Boulevard de la Madeleine”. The group released the singles “Fly Me High” and “Really Haven’t Got the Time” followed by “Love And Beauty” & “Leave This Man Alone”.The Moody Blues were then offered a deal to make a rock and roll version of Antonín Dvořák’s New World Symphony, and although executives were initially skeptical about the hybrid style of the resulting concept album. Days of Future Past became one of the most successful pop/rock releases of the period, earning a gold record award. It takes place over the course of a single day & drew inspiration from the pioneering use of the classical instrumentation by The Beatles. It includes the songs “Nights in White Satin” & “The Sun Set” “Another Morning”, “Twilight Time”,”Peak Hour” and “Evening (Time To Get Away)”. The 1968 follow-up LP, In Search of the Lost Chord included the songs “Legend of a Mind”,”House of Four Doors”,”Voices in the Sky”, “Ride My See-Saw” and “The Best Way To Travel”. The Moody Blues also performed live at the Birmingham Heart Beat Charity Concert 1986 which raised money for the Birmingham Children’s Hospitals, and also provided backup with the Electric Light Orchestra for George Harrison.The Moodies released Sur La Mer in 1988 containing the single, “I Know You’re Out There Somewhere”.In 1991 they released the album Keys of the Kingdom contained the songs “Say It With Love”, “Never Blame The Rainbows For The Rain”,”Bless the Wings (That Bring You Back)”,”Magic” “Shadows On the Wall” “Lean On Me (Tonight)”and “Say What You Mean.”They also played at the Montreux Jazz Festival and remained. a steady concert draw, They also made a series of recordings of their Night at Red Rocks concert.The next album Strange Times, was released in 1999 with the songs”English Sunset”,”Nothing Changes” and”This is The Moment”.The Moody Blues also appeared in one episode of “The Simpsons” called “Viva Ned Flanders”.In 2000, the band released “Hall of Fame”, a new live concert from Royal Albert Hall. In 2001, an IMAX film was released, entitled Journey into Amazing Caves. In 2006, the first five of the band’s ‘Core Seven’ albums ( Days of Future Passed to Seventh Sojourn) were re-released featuring bonus songs and previously unreleased tracks.Remastered versions of Octave, Long Distance Voyager and The Present soon followed. The Moodies also released a compilation of sessions recorded at BBC Studios, rarities & various TV appearances, entitled Live at the BBC: 1967-1970. The Moody Blues have sold more than 70 million albums worldwide and have been awarded 14 platinum and gold discs. As of 2012 they remain active and continue to tour.